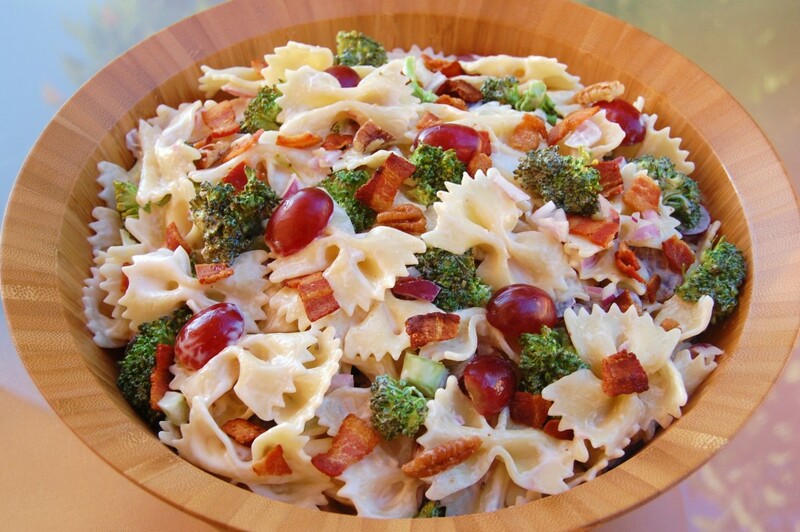 Bow-tie pasta, broccoli florets, crispy bacon, red grapes, onion, and toasted pecans, come together to make one beautiful salad! Preheat oven to 350 degrees. Bake pecans in a single layer on a sheet pan for 5 to 7 minutes or until lightly toasted and fragrant, stirring halfway through. Set aside to cool. Meanwhile, cut broccoli florets from stems, and separate florets into small pieces using the tip of a paring knife. Peel away tough outer layer of stems, and finely chop stems. Slice grapes in half and dice the onion. Place cut vegetables and fruit into a large bowl. Add hot cooked pasta. In a small bowl, whisk together mayonnaise, sugar, red wine vinegar, and salt. 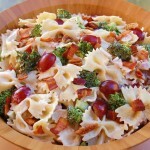 Pour dressing over pasta and veggies, toss to coat. Cover and chill for 3 hours. Just before serving, stir in cooked bacon and toasted pecans. Cook's Note: You can substitute sesame seeds or slivered almonds for pecan if desired.